TheSearch.net is the PUP that uses misleading techniques to prevent removal. Use Reimage to locate malicious components and get rid of them faster than with uninstall instructions. A full system scan blocks virus reappearance and prevents traffic to malicious domains. What should you know before using theSearch.net? How should I remove TheSearch.net? TheSearch.net virus might hijack your computer whether you are a regular Internet user or just occasionally browse the Web. This search engine might look like a reliable search engine. It doesn’t require any special knowledge to see that this browsing tool fails to perform the same as a reliable and legitimate tool. However, you should be aware that this PUP belongs to the category of browser hijackers. It means that you might be redirected to a completely different domain, or your browser might be stuffed with an enormous amount of intrusive banners and commercial offers. We highly recommend you to proceed to theSearch.net removal. For that purpose, Reimage will be of assistance. The developers of this hijacker did not try hard to create an impelling and attractive design. On the other hand, they anticipate that without colorful veneer they will attract more users who are quality-oriented. It does not offer you any quick access links to popular domains or other references to affiliated domains. Though this might be hijacker’s advantage, its drawbacks significantly outweigh. When you type any topic, the number of delivered search results is ridiculously low. While legitimate search databases provide millions of search results, theSearch.net fails to keep up. It might look like as if it uses Google as the main database, however, do not fall into deception. Because this hijacker employs a certain “filter”, it provides different search results. You might notice that there are more advertising-related search targets. In addition, this questionable browsing tool deprived you of the ability to evade potentially dangerous websites because it switches off the security plug-in. In addition, theSearch.net redirect becomes a burden. Due to this phenomenon, you cannot access the wanted websites as quickly as you expect. 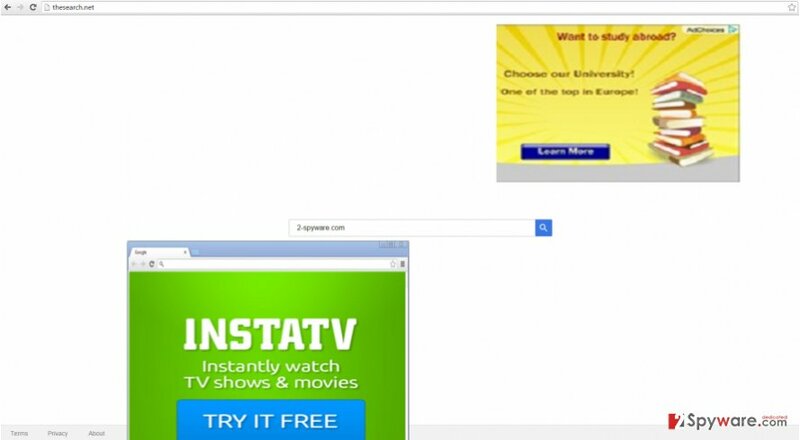 The emerging redirect pop-ups greatly slow down the overall speed of the browser processing. Keep in mind that you should not visit those domains either since they might shelter vivid malware. All in all, remove theSearch.net permanently. There are two ways to put an end to this hijacker – either manually or automatically. If you opt for the former method, make sure not to miss any vital detail while performing each removal stage. Some users might find this method time-consuming and bothersome. In that case, opt for the automatic TheSearch.net removal option. Install an anti-spyware application. Afterward, the elimination process will only take several minutes. You can be sure that the hijacker is completely deleted. Additionally, it guards your back while you browse the Web. Here, look for TheSearch.net or any other recently installed suspicious programs. Wait until you see Applications folder and look for TheSearch.net or any other suspicious programs on it. Now right click on every of such entries and select Move to Trash. When in the new window, check Delete personal settings and select Reset again to complete TheSearch.net removal. Once these steps are finished, TheSearch.net should be removed from your Microsoft Edge browser. Here, select TheSearch.net and other questionable plugins. Click Remove to delete these entries. Now you will see Reset Firefox to its default state message with Reset Firefox button. Click this button for several times and complete TheSearch.net removal. Here, select TheSearch.net and other malicious plugins and select trash icon to delete these entries. Click Reset to confirm this action and complete TheSearch.net removal. Here, select Extensions and look for TheSearch.net or other suspicious entries. Click on the Uninstall button to get rid each of them. Here, look at the Homepage field. If it was altered by TheSearch.net, remove unwanted link and enter the one that you want to use for your searches. Remember to include the "http://" before typing in the address of the page. Now you will see a detailed dialog window filled with reset options. All of those options are usually checked, but you can specify which of them you want to reset. Click the Reset button to complete TheSearch.net removal process. This entry was posted on 2016-07-21 at 04:47 and is filed under Stealing programs, Viruses. You can quickly scan the QR code with your mobile device and have TheSearch.net virus manual removal instructions right in your pocket. How did you remove TheSearch.net virus?